It is impossible to speak of the equation known as The RAMM:ELL:ZEE without acknowledging the cypher that he was; an arsenal of contradictions conveyed through an unremitting verbal and creative flow. 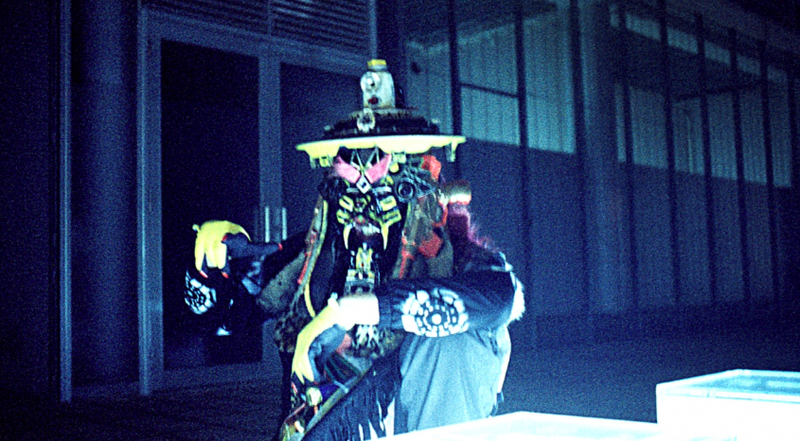 At once manic genius, prolific polymath, irascible overlord, charming hustler, quantum hobbyist, and incoherent madman; at the core, Rammellzee was a supreme myth-maker, one who makes sense of the senseless. As a young graffiti writer and MC growing up in the urban miasma that was New York City in the 1970s, Rammellzee existed from the start as an outlier. Born of mixed African-American and Italian heritage, and raised in the projects of Far Rockaway, aka Rocky Far-Away—the isolated seaside community stationed at the southern end of the A train—he bore his singular street identity as a mantle of the alien and otherworldly. The official mythos begins with legal decree in 1979, abandoning his given name, and adopting the militaristic equation The RAMM:ELL:ZEE as his lawful moniker. It was also this year that Rammellzee penned the first of a series of complex, discursive, visionary manifestos detailing his ever-developing cosmology of Gothic Futurism and the concept of Ikonoklast Panzerism. Rammellzee perceived language as a structurally-flawed agent of an antagonistic societal operating system. He formulated an evolution of wildstyle lettering that would liberate, weaponize, and deploy the letter like an immune system response, circulating an attack on what he called contemporary “diseased culture” and the institutions of control. Steadfast in his mission, Rammellzee advanced his mythos of Gothic Futurism through various arenas of power. After having earned a reputation as a seminal graffiti writer and MC by the early 1980s, he caught the attention of the contemporary art world, where he quickly ascended the ranks finding further opportunity and bedrock for the development of his ideologies. Where kinetic subway cars provided the viral methodology needed to distribute his burgeoning theories, the artworld of the 1980s—influential, wealthy, and eager to harness the vitality of authentic, New York graffiti writers—proved to be the vessel best suited to propel the war machine. Over the next decade, he would produce, with unassailable acumen, a diverse and materially-rich body of work, much of which was quickly acquired and tucked away in collections throughout Europe. As the decade came to a close, the frequency of exhibitions and museum shows thinned. Conveniently, the mythos, poised for the next phase, had already begun work on what would become his magnum opus and the final leg of his corporeal mission. 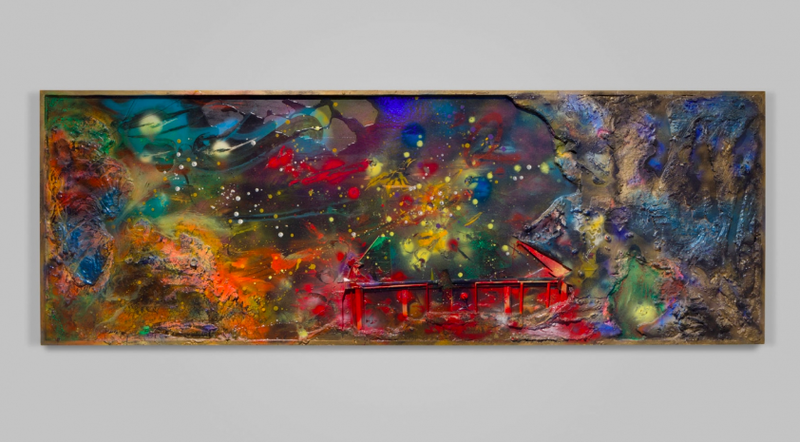 By the early 1990s, the increasing density and complexity of Rammellzee’s epistemology necessitated a materialization of ideas and proliferation of personalities, made real through elaborate epoxy-driven assemblages and costumes. His Tribeca loft, a sprawling, uncontainable construction known as the Battlestation, became the hangar for his fleet of Letter Racers, Monster Models, and Garbage Gods, all forged from the detritus of the local consuming class. In a schizophrenic gesture, Rammellzee himself fragmented into oppositional battalions of alien bookies and demi-god gangsters, tricked out with ornate robes, masks, and weaponry exquisitely crafted and engineered from garbage. Performing as these various identities, Rammellzee presented in its most complex and fully realized form the binary battle of opposition that pervaded his mythology. RAMMΣLLZΣΣ: Racing for Thunder presents, for the first time, a diverse selection of artworks, music, writings, rare archival documentation, and ephemera, gathered from disparate sources around the world, to outline a chronology of this remarkably complicated artist. Told by the people closest to him, the collection of oral histories, recorded on site and presented throughout the exhibition, act as a shared history, framing Rammellzee’s influence and memorializing the man who inspired, compelled, and galvanized nearly every person he encountered. While enigmatic and esoteric, Rammellzee’s work is also premonitory, warning that language has been co-opted as a tool of social and political manipulation. It is safe to say that we are far closer to the beginning, than the end of measuring the full impact left by The RAMM:ELL:ZEE.